A few weeks ago, I purchased a pressure cooker. With the colder months around the corner, the thought of making homemade stocks for winter soups had my mind spinning with ideas. But all those ideas unfortunately came to halt when I realized exactly how many hours I would have multiple gallons of liquid sitting at a simmer on my meager stove. Having not yet found that particular tree on which dollar bills blossom forth, my plans were set back until I could find a quicker and more energy efficient method of simmering. Enter the pressure cooker. What would normally take 6-8 hours on the stove can be accomplished in under one hour in a pressure cooker. You can read all about pressure cookers and their benefits here. In addition to stocks, I also began to get excited about soaking my own beans. During the fall and winter months, I tend to gravitate towards a bowl full of legumes after I get home from work. They are the perfect winter food. So, to test out my new-fangled pressure cooker, I started soaking some navy beans. 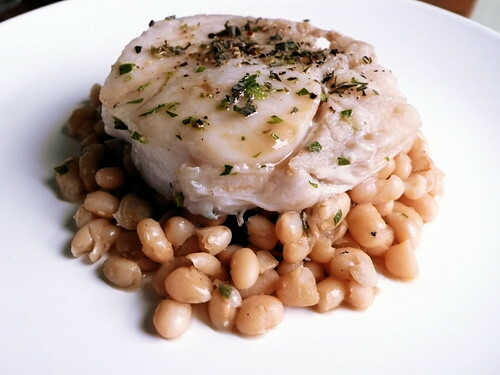 Navy beans need to be soaked for at least four hours prior to cooking. It is very important to not add any salt during the soaking or cooking process. While we are leaving salt out, let's leave out anything acidic as well (wine, vinegar, lemon juice, tomatoes, etc.). They can all be added in after cooking. Once the beans are soaked, they only take 12-13 minutes in the pressure cooker, compared to between 1 and 1 1/2 hours on the stove. In a large bowl, soak beans in several quarts of water. Remember that the beans will double, even triple in size. Make sure you have enough water. Soak for at least four hours, changing the water halfway through. Drain beans and add to the pressure cooker, along with the stock, sprigs of oregano, and shallot. Once the cooker is brought up to full pressure, cook for 13 minutes. Consult your manual before using your pressure cooker! When time is up, release pressure through the pressure release valve. Stand back as to not get burned by the steam. Take a few ladle fulls of beans and stock and place in a saute pan over medium heat. (Save the remainder of the beans to eat at a later date). Whisk in butter until combined. 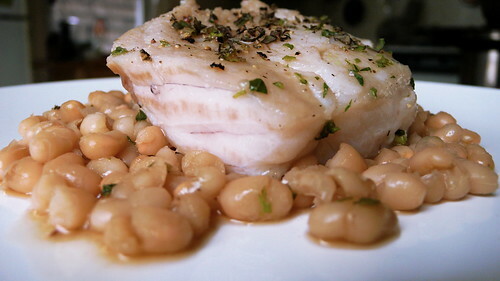 Season the fish with salt, pepper, and chopped oregano and place gently on top of the beans. Cover and gently simmer for five minutes. Flip the fish and cover and cook for four more minutes. Remove fish from heat and continue simmering stock and reduce until it starts to thicken. Taste and season with salt and pepper appropriately. As a PROFESSIONAL CHEF who graduated from Peter Kump's Culinary School in my hometown of Brooklyn, New York, I am qualified to comment on your recipe. It sounds good, but it is NOT very original. I mean, most people have known how to cook navy beans for a hundred years before you were even born. And I am also the SENIOR ADVISER to Mr. Ed Levine's website, SeriouEats. you're right, louise. 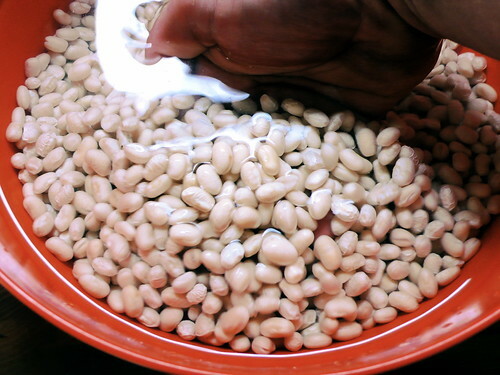 many people do know how to soak and prepare beans. but, since most supermarkets i've been to have an abundance of canned beans instead of dried beans, that leaves me to believe that more people out there should know how it's done. Not to enter a navy bean controversy and take sides, but i'm happy to read your advice on navy beans. I happen to LOVE the United States Navy. What's seriou seats? is That place that sells really deadpan office chairs? The idea of having a pressure cooker has been flitting around in my mind lately. To tell you the truth though, I don't really understand the possibilities with the exception of canning. Now, beans... that's an eye opener! My husband's doctor has advised him that he must include more fiber in his diet, so I have been searching high and low for recipes using dried beans. Except that braising fish makes no sense to me, sorry. Braising is, by definition, a technique in which one cooks something for a long time at a low temperature in a closed vessel, with liquid. To emply this technique with fish would ruin it. sorry, liz, but i have to disagree. while you are right about the definition of braising, braising fish does not ruin it. there are such things as quick braises which are perfect for fish. the fish comes out well done but still incredibly tender. give it a shot.